This past weekend we had Caleb's parents in town visiting us, and as I was planning the menu and thinking about what to cook, I realized I had made not one peach dessert this summer! I'm trying to hang on to summer as long as possible (even if school has started), so I figured a peach pie would be the perfect summer-isn't-over-yet dessert. This was my first go at peach pie, but I have to say I'm quite pleased with how it turned out. I always make my pie dough a couple of days before I make a pie (I store it wrapped well in the fridge or freezer), and I also made the crumble the night before and stored it in the fridge. When it came time to make the pie on Friday afternoon, I prepped the peaches and made the filling and put it all together in no time at all. Heat oven to 375 degrees. Lightly flour a rolling pin and work surface and roll out pie dough to a 12-inch round. Place in a 9-inch pie plate, fold overhang under, and crimp edges. Make the filling: in a large bowl, toss together peaches, brown sugar, and flour until combined. Make the crumble: in a small bowl, combine brown sugar, flour, and oats; using a pastry blender, work in butter until large clumps form. Transfer peach filling to pie shell, then sprinkle crumble evenly over top. Place pie on a rimmed baking sheet and bake until juices are bubbling and topping is golden, 1 hour to 1 hour 15 minutes. Let cool on a wire rack 1 1/2 hours before serving. Store, covered, at room temperature up to 2 days. This looks and sounds so good. 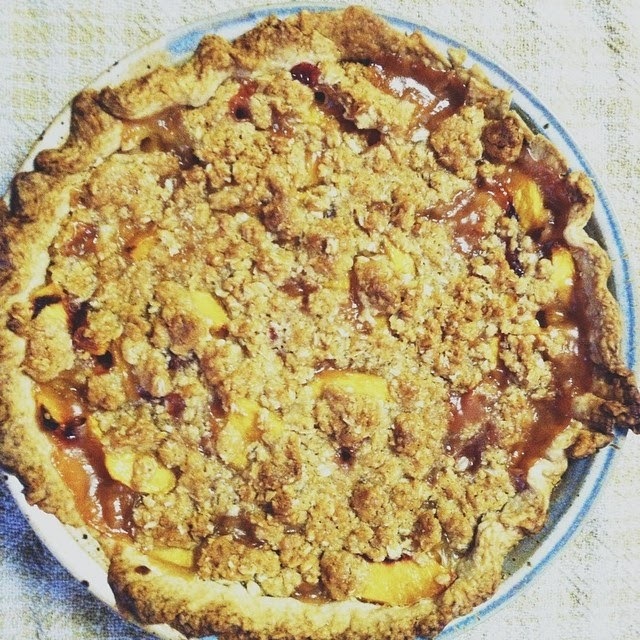 Peach pie is one of my favorites, but no one else in my family likes it. Hope you all had a nice visit!